The small house directly across the street from ours is probably a simple Craftsman of the same era as our own. In the three decades that we’ve lived here, we’ve seen several couples move in, start a family, and then move out when they realize they’ve outgrown it after one or two children. I sympathize with young families who want to stay in the city but eventually have to move to the ‘burbs to find houses that are both affordable and large enough. (It’s a growing problem in these parts, where the Seattle Times just reported that the cost of living is now worse than the traffic.) The family that lives there now just had their second child, and I’m wondering how long they will be there. 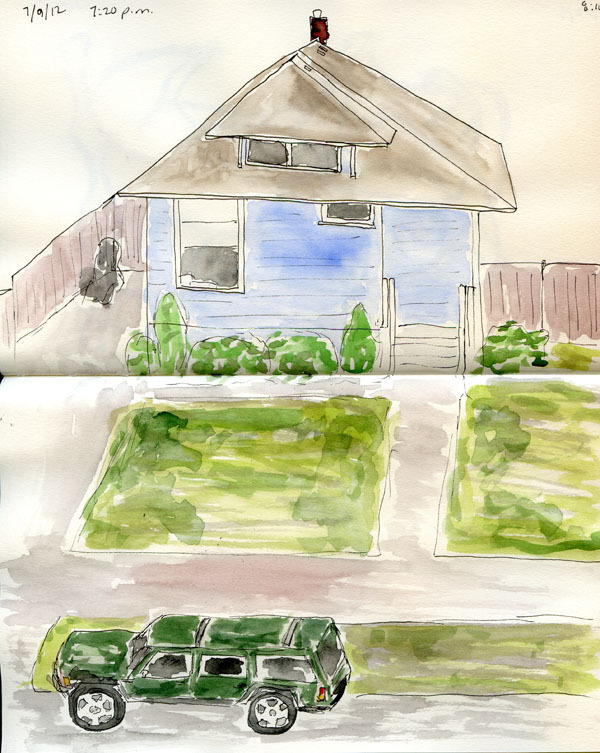 I sketched this from our upstairs bedroom window, where the high vantage point gives me an especially difficult perspective challenge. I took on this same view six years ago (at right) when I was just starting to slay the architectural nemesis. 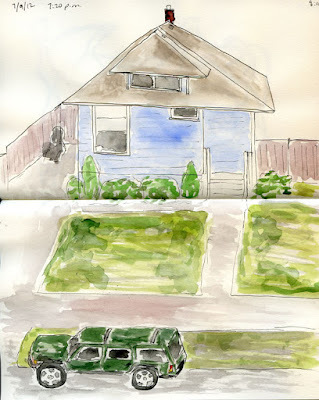 I ended that blog post with this: “Let’s just call this a baseline against which I’ll evaluate my progress.” I hope you can see that I’ve progressed (the trees and shrubs have grown, too! ), but I’m not sure it was any easier now than it was then. Practice may have made my results better, but it hasn’t necessarily made the process less challenging. Rereading that post from 2012 reminded me that I’ve declared several sketching nemeses over time. First it was architecture; then it was cars; and then trees. The only way to conquer any nemesis is to simply practice regularly (avoidance never works; I’ve tried that, too), and I’ve made that effort with both cars and trees. 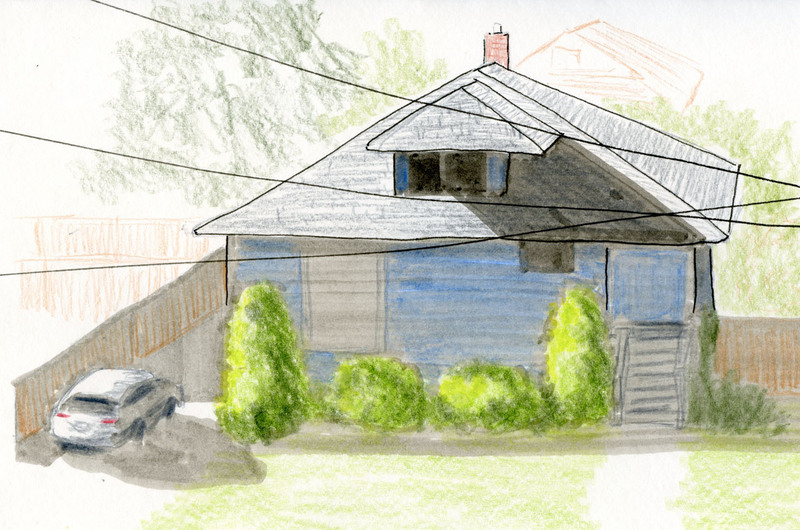 Until I started my current series on neighborhood architectural styles, architecture as subject matter just hasn’t engaged my attention enough to get the practice I need. I’m happy that I finally found an entryway to work on slaying this long-standing nemesis at last.